HomeInsightsBlogAfricaIs UAE an easy-win market for Health & Beauty companies? Ranked as the 5th among developing countries for future potential growth, the retail sector of the UAE keeps expanding beyond expectations. Despite recent signs of saturation, Dubai was still expected to add around 717,000 sqm of new retail space in 2018, while more 467,000 were expected to be added in Abu Dhabi. The overall market was estimated to be worth around USD 55 billion, with up to 16% of annual growth forecasted for the next years, surely benefiting from the Expo 2020 effect. The sector is evolving. From one side, it is adapting to external stimulation such as the recent introduction of the VAT, that has led retailers to increase the value offered to shoppers. From the other side, the sector is innovating from within, given the increasing relevance of online shopping, direct selling and home shopping (6.5% of total market in 2023, from 4.2% in 2018). 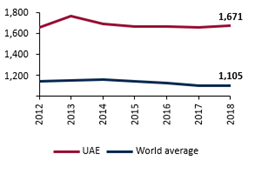 The Emirates are indeed considered a shopping destination by international tourists, and their spending patterns are quite higher than the average tourist (USD 1,671 against USD 1,105 on average). The country welcomed more than 21 million tourists in 2018 and this number is expected to grow up to 33.5 million by 2028. The expected amount spent by these tourists will exceed USD 55 billion, which will be a conspicuous boost for retail, among other side sectors especially given the traveler propensity to purchase and consume Luxury goods. Many sectors are benefiting and boosting at the same time this general growth, establishing a virtuous circle that serves the entire economy of the country. 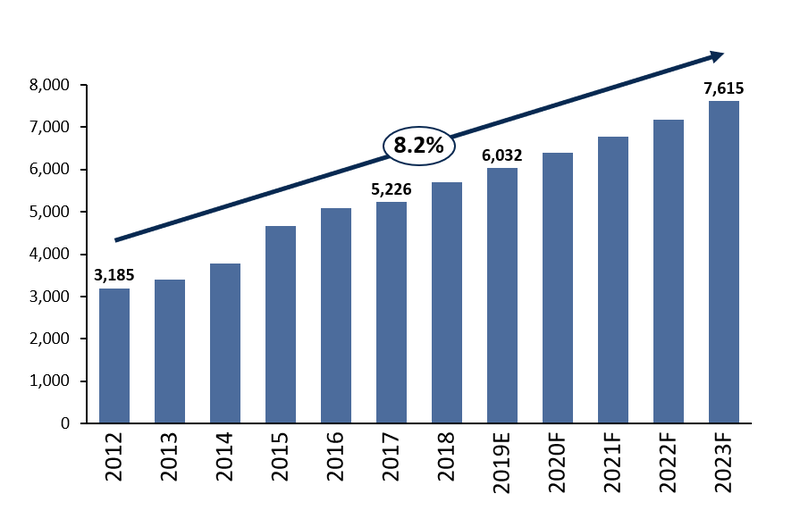 Among them, the sales of Health & Beauty products almost doubled in the period between 2012 and 2019, when they overall value of product sold is expected to exceed USD 6 billion. With the 46% of market held by the top 6 players, the sector in not particularly concentrated. 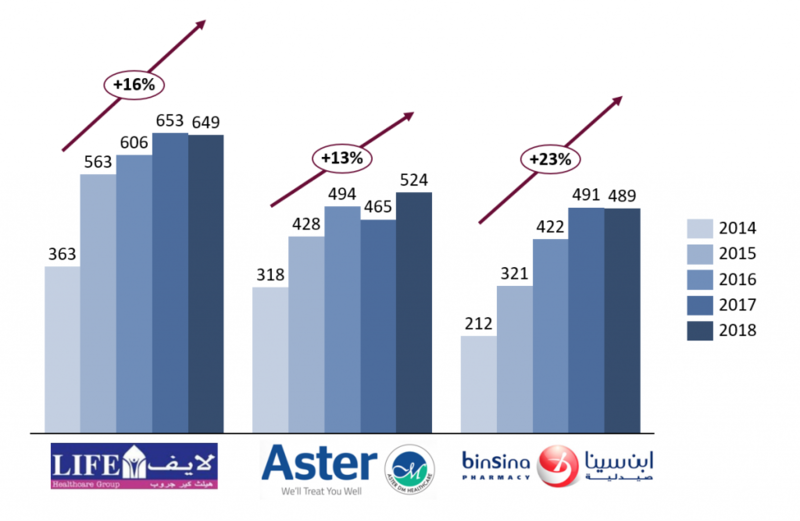 However, the big pharmacy chains have the lion’s share of this market, with the top 3 retailers recording double digit yearly growth in the last five years. The sector is regularly attracting further investors, such as O Boticario, the Brazilian retail chain specialized in cosmetic, skin care and fragrances, that recently invested in the country. In parallel, long-lasting players still have to innovate to match the continuously evolving customer demands, replacing non-performing brands with other that match the current client trends. To be able to differentiate their offer from competition, cosmetics and skin care operators need to accurately channel their investments and to establish a bilateral communication with more and more educated customers. For instance, most famous international brands leverage brand reputation and already well-known quality, still need to invest millions on product advertisement, press engagement and new social media (ex. by collaborating with Instagram influencers). On another hand, more niche brands need to focus on specific customer segments, engaging them through demo or through a network of doctors able to appreciate and recommend the products to their patients. A deep understanding of the market mechanisms becomes then a must-have to successfully compete in a very promising and dynamic market.